April showers.......GO AWAY! Oh wait, that's not how the saying goes! And it's not April anymore, Happy May Day. But seriously, enough of the rain already, I need Spring flowers and sunshine. Today, the Papertrey girls are celebrating Spring, rain or shine. We've all selected an inspiration photo and made a project inspired by it. I chose this photo below from my Inspiration Notebook. 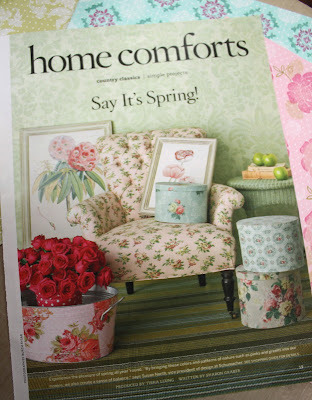 The soft, pretty colors and florals remind me of what I love about Spring. After studying my photo up close, I saw several wonderful patterns that I wanted to create for my project. I wanted to create some custom designer papers that had the feel of Grandma's wallpaper. For all of my papers, I used the 2008 Bitty Dot Basics patterned paper for my base. I think this is a great little tip because you instantly have the fun polka dots and a soft colored background. For my first design, I wanted to recreate the hat box design, zoom in for a closer look. I used an Aqua Mist base paper along with the following Papertrey supplies: Guidelines Two, Guidelines, and Everyday Classics stamps(white flower)...and Hibiscus Burst, Fresh Snow and Ocean Tides ink. I feel like you could peel this right off Grandma's wall! For my second design, I wanted to recreate the pretty damask design on the wall. I used a Spring Moss background paper and the following Papertrey supplies: Damask Designs and Spiral Bouquet(word Bloom you can see if you zoom in)...and Fresh Snow and Spring Moss ink. Very designer looking. For my last piece, I just loved the polka dots and roses on this fun tin container. I used a Sweet Blush background paper and the following PTI supplies: Garden of Life(flower, leaf and polka dot) and Spiral Bouquet(green sprig) stamps.....and Sweet Blush, Hibiscus Burst, Spring Moss, Ripe Avocado and Fresh Snow inks. To create the two toned flowers, I used the *rock and roll* stamping method...stamp flower in Sweet Blush then roll edges in Hibiscus Burst, then stamp. Okay, I have my 3 custom stamped papers but now what? I wasn't sure what to make yet so I just pulled together some matching elements: Hibiscus Burst, New Leaf and White Vintage Buttons and Hibiscus Burst and Ripe Avocado ribbons. Notice these contrast a little with the colors on my stamped papers.....not overly matchy-matchy...and I like it. I decided what I wanted to make....some covered notebooks for Spring gifts for friends and family. I wanted a little sentiment, so I stamped *celebrate today* from Mega Mixed Messages onto some of my custom patterned paper..then the loopy circle from Borders and Corners Circles. I used a circle punch and the Super Scalloped punch for quick work of making an embellishment. Then I just cut strips of my patterned paper and applied it to my notebook fronts. I just love the quirky, fun colors. 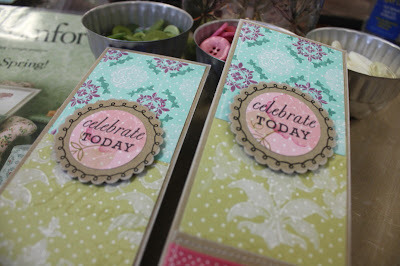 Here's a shot of my sentiment embellishments, up on pop dots for emphasis. And here's a shot of a little strip embellishment I added. I adhered my ribbons and tied Vintage Buttons to Kraft cardstock. There's machine stitching around the edges and the bottom edge is punched with an EK Success border punch. All Kraft edges are inked with Fresh Snow ink. 1. Stamp designs on patterned paper for a new look instead of using plain cardstock. 2. Mix and match your stamp sets to get the most bang for your buck...I used EIGHT different sets to create my custom papers. 3. Don't be so matchy-matchy with your colors..let loose, get funky with it. 4. Use those big honkin Vintage Buttons on projects like this that don't have to be mailed. They add some great dimension to your projects. 5. 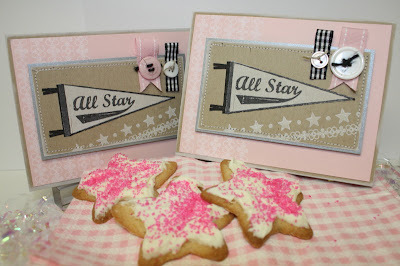 Use Scor-Tape to adhere items like ribbon snippets and bulkier items like stitched cardstock. 6. Use punches when mass producing to make quick easy work. 7. Start your Inspiration Notebook today, you'll never be without an idea. Now.....since I think I must hoard these two little morslets of Spring goodness for myself, I must create more to give away. 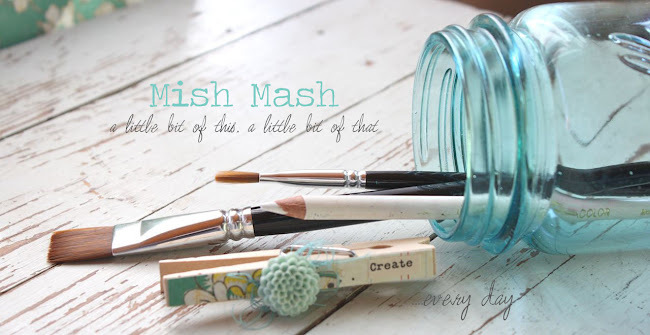 I hope you are inspired to make some fun little creations for yourself. 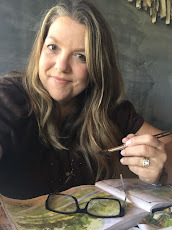 Check out Nichole's BLOG for a challenge. What's brewin' bloggies? I have been working very hard in my stamp room on some upcoming projects. May is going to be a fun month!! I don't know about you but there's nothing like that morning cup of coffee to get you pumped up. I don't know if it's so much the caffeine for me or just the ritual of having a nice, hot, steaming cup of coffee....with 2 Splenda and a splash of creamer. Ya, I like a little coffee with my add-ins. Just Rite has a new set all about the coffee called Just A Little Caffeine. It's a great set for making cards to send out to your caffeinated friends. There's just something about coffee themed cards that are warm and cozy and just make you feel good. In this set, there are 6 outside borders and 6 inside centers...all can be stamped mixy/matchy to create lots of different looks. For my card, I cut out the coffee images with a Spellbinder's Circle Nestabilities Die and then mounted that onto a Labels 1 Die. Patterned papers is from October Afternoon. 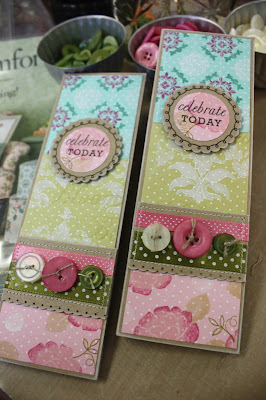 Ribbons, Vintage Buttons and base card in Kraft cardstock from Papertrey Ink. I hope your week is brewing up some great things. It's back to the stamp room for me, peeps! This week, I sent a little batch of cookies with Josey to her track meet. She has a group of girls that she hangs out with and I thought they would love some yummy treats. I used Just Rite's new Homemade Treats set and simply stamped the images with black ink onto Papertrey Hibiscus Burst solid color cardstock. I added some glitter to the milk glasses and then punched out my circles with Marvy punches. I tucked the cookies into some Papertrey Large Glassine Bags and tied on some extra long ribbons. The girls like to wear the ribbons in their pony tails. While I had my stamps out I made a card. I added a little more detail this time, using my Copic markers to color in the cookies and to add a little shading. I cut and embossed my main image with a Spellbinder's Circle Nestabilities Die and then adhered that to a scallop cut Spellbinder's die. I love that Just Rite is coming out with images that can be colored. It just adds so much to projects to see a little color. I'm keeping this card in my stash to give out to a friend/teacher next time I bake a batch of chocolate chip cookies. Well, Jordan will be getting off the bus soon so I'm going to scoot on out of here and start my weekend. I did a little shopping in the big city today while visiting my brother in the hospital. I'm hoping to use some of my goodies on some scrapbooking projects (I've really gotten back into my scrapbooking and I LOVE it!! ).....and I'm going to spend some good, quality time with the family over the weekend. Have a great weekend everyone!! Karen Lockhart has the neatest stamps with shoe themes. I always thought this Umbrella Shoe was clever but didn't quite know what sentiment to pair with it. Dawn's sentiments from Scattered Showers work perfectly. This card would be perfect for someone having *one of those days*. I stamped the umbrella show image onto the polka dot patterned paper, then inked it up a little with a *B00* Copic Sketch marker and then cut the image out. I adhered it to the Spellbinder's Oval and Scalloped Ovals with pop dots. I add PTI Vintage Buttons and a punched circle for embellishments. Patterned paper from My Mind's Eye. Be sure to zoom inon the photo above to see the tone on tone cream colored background. The texture comes from Spellbinder's new Butterfly Impressabilities stencil. The embossing is really distinct and makes pretty backgrounds. I can't wait to try this with airbrushing...the stencils are a thin sheet of metal with the images cut out. As for me, I'm tired of the rain.....and it's a beautiful day out.......so I'm stepping out of blog land and into the sunshine! Many of you requested my mom's Orange Spiced Tea recipe so here it is for you today. 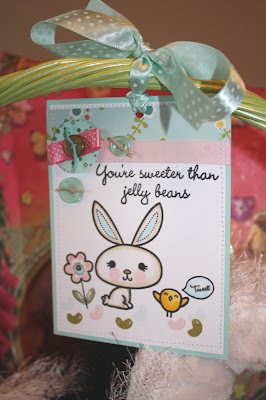 :) I used Melon Berry cardstock from Papertrey for the base. Recipe is printed from my computer on 8.5 x 11 cardstock and then cut down to size. Embellishment strips are cardstock from My Mind's Eye and ribbon snippets from Papertrey in Aqua Mist and Melon Berry. I also stamped some tea pot images from Papertrey's Tea for Two on the recipe card. For the round embellishment piece, I stamped Karen Lockhart's Itty Bitty Tea Pot onto some October Afternoon patterned paper and cut it out. I adhered that to a Papertrey circle stamp from Tea for Two. I used punches for both layers of the circles. Mix all ingredients together and store in airtight container. To drink, add 2-3 heaping teaspoons to boiling water and enjoy. Note: 1. The Becky Higgins script font can be found at her blog HERE under the products tab. 2. I'm not sure what you can substitute if you can't find Tang where you shop, it's always been available around my area. 3. The amount of lemonade you add is up to you, depending on the desired tartness. 4. All of my recipe cards are 4" x 6" in size, and you can view more by clicking on the recipe label at the end of this post. Happy Monday everyone! I hope your week is off to a good start. Today I have a pretty little card using Karen Lockhart's Cherries in Colander stamp, along with some Itty Bitty Cherries. I love to color Karen's images in with Copic Sketch markers, the details of her stamps just beg for color. One thing that is fun to do from time to time is color on paper surfaces other than cream or white. Here, I stamped my images onto Papertrey Kraft cardstock and then colored them just as I would as if I were using white cardstock. I used a white gel pen to give highlights to the cherries, and then outlined the colander and Itty Bitty Cherries with a B00 marker. 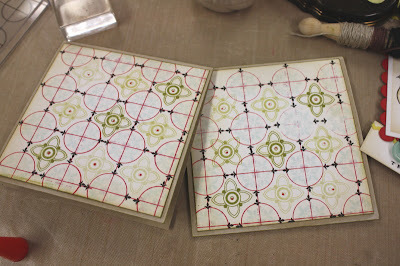 I also outlined the bottom of the lace stamp from Crafty Secrets (see photo above). It really adds some dimension to the colored images. I punched my main image with a scalloped circle Marvy punch (from PTI) and used a new EK Success border punch along the Itty Bitty image piece..then inked all edges with PTI Fresh Snow ink. I got my EK punches from my favorite local scrapbook store, Scrapbooks, Etc in Topeka, Ks. Love those girls, gotta support our local businesses! The topper for my card was made to resemble a little curtain. I used a stretchy ribbon from my stash and a double line of stitching to finish it off. Vintage buttons and a Papertrey sentiment from Everyday Classics finish off my focal piece. I colored the bottom scallop portion with my green Copic marker and a white gel pen. Patterned paper is from October Afternoon. Tip: When adhering buttons (I use Zip Dry adhesive), use simple clothespins to keep the buttons secure until they dry. Thought you might like to see a couple of things I scored at an antique store...a jar of Vintage white buttons for $3 bucks. I love that most of them are tied....seems that the ladies were very frugal in the day and did not waste one single button. Many buttons I find have been snipped right off the clothing item because I can usually find snippets of fabric on the back of the button. And I added this old drawer to my collection also. I stood it upright and it holds my growing collection of EK Success slimline border punches. That's it for today. Hoping to cross a lot of to do items off my list so I better scoot on out of here. Have a great week! 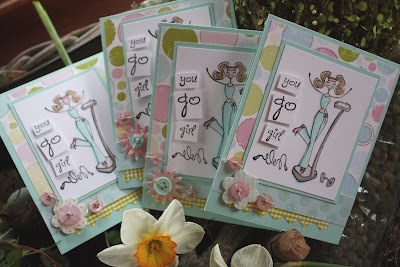 My friend Carmen came over to stamp and brought these cute Bella girl stamps from Stamping Bella. We made up some fun cards for our *big loser* friends. There's nothing better than receiving encouragement from friends and family when you're trying to lose weight! I think I should just send all these to myself...I need all the help I can get!! 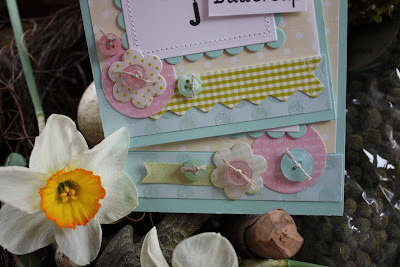 Papers and embellishments are from Making Memories Garden Party line. Vintage Buttons and base cardstock of Aqua Mist from Papertrey. The images are colored with Copic Sketch markers. The brush tips of the Sketch markers are so nice for coloring the little spaces of the Bella stamps. Here's a closeup of all the little button embellishments. Thanks for letting me borrow your stamps Carmen! I can't wait to send these out. Nichole did such a fantastic job with her Tea for Two set. I think when we think of tea, we think comforting thoughts....warm and cozy...visiting with friends. So it's perfect to use Tea for Two for get well, thinking of you and birthday cards for friends and family. This first card I'm showing you is a get well card using Tea for Two, Background Basics: Spots and Dots, Guidelines patterned paper, Plum Pudding ink and ribbons. This card along with my other creations are in the PTI gallery. 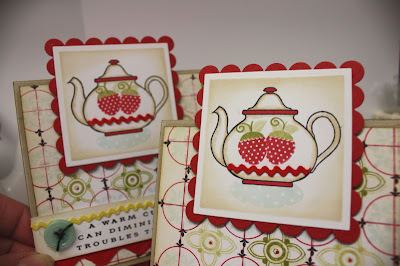 These two cards below are new creations that I made which were inspired by my strawberry tea pot and fabrics. I used Pure Poppy for the teapots and punched them out with oval punches, such an easy and quick way to make a focal image. I layered each oval onto a stitched square of Kraft cardstock and added a sentiment. I compiled this fun sentiment from Heartfelt Basics and the word *tea* which I cut out from a Tea for Two sentiment. Tied Vintage Buttons, some white Saddle Stitched ribbon and some vintage looking ribbon adorn the bottom of the card. Patterned papers are from Cosmo Cricket. This card below uses the *absolutely fabulous* sentiment from Mega Mixed Messages along with one from Tea for Two. I love to mix and match sentiments. Tied Vintage Buttons finish off the corner of the card. I'm glad to hear that so many of you love this set! I knew it would be a big hit and Nichole did a fantastic job with it! As always, thank you so, soooooo much for your nice comments! I do love them!! 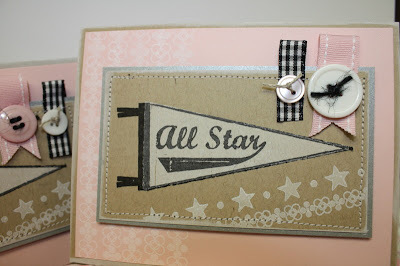 Still lovin' Pine's All Star Team stamp set from Papertrey! With track season in full force, my days have been very busy. I'm lucky enough to be able to go to all of Josey's track meets...but a lot of parents just can't take off the entire day to go. So I've kinda become the *track mom* to a lot of the kids.....I text their parents to let them know how their kid did in an event, bring snacks, watch over stuff, etc. It's a good job to have! I thought it would be nice to make a few cards for some of Josey's closest friends...just to tell them they're doing a great job. Pine's set is perfect! I stamped the pennant images in Fresh Snow and True Black onto Kraft cardstock. I stitched around the top layer and then matted it with silver metallic cardstock. Embellishments are tied Vintage Buttons, black/white ribbon and Sweet Blush Saddle Stitched ribbon. The background layer is Lisa's Background Basics: Spots and Dots in Fresh Snow Ink. I also added a little stamped strip of it onto my main image layer along with some stars. I love the soft look to this card for my sporty girls. I may have to get busy and make some more!! Have a great day everyone...I'm off to do a little shopping today before the three days of rain sets in. Blech...need sun...for my garden...no rain...........no rain. However...I can handle the pile of socks below. I love Karen Lockhart's Warm Socks stamp along with the "well, that stinks" sentiment. These days, it seems like more and more of my friends are being affected by the economy, illnesses, family stuff, etc. Life is hectic for everyone. It's the perfect time to send out lots of cards to let those we care about know that we're thinking about them. These cards are perfect! I used up some more of my stash of Making Memories Garden Party papers that I had sitting out, along with some tied Papertrey Vintage Buttons. The base for the cards is Papertrey Kraft cardstock. I paper pieced the socks onto some of the striped patterned paper and Josey colored in a few parts with a pink Copic marker for me. Then I just stamped the image again onto the green gingham paper and adhered my cut out socks. All the little scallops on the patterned paper pieces were just little snippets that I cut off here and there from the papers in my kit. Easy peasy cards that came together really quickly. I must get these out in the mail....my friends need me!! Woohoo, what a fun release this month for Papertrey! I'd love to hear if you stayed up late and what you ordered!! 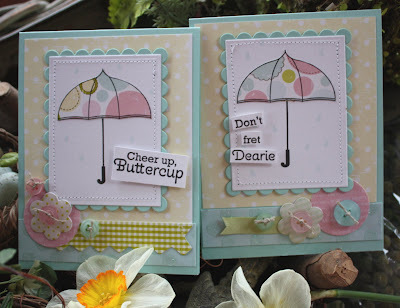 Dawn McVey introduced a darling new set this month for Papertrey called Scattered Showers. There are many combinations of umbrella patterns and one of my favorites is the outline umbrella image so that I can paper piece my umbrella using patterned paper. Here, I've used some Making Memories Garden Party paper from last year's stash for the umbrella and the background paper. The images were layered onto Spellbinder's Rectangle and Scalloped Rectangle Dies. I stamped the sentiments and adered them to the image pieces with pop dots. For embellishments, I added some tied Vintage Buttons, some flower epoxy stickers from the MM Garden Party collection, patterned paper snippets and circles and some Papertrey ribbon. I just love to mixy matchy all those fun little elements. And how about the new colors of the Vintage Buttons? The Sweet Blush and Aqua Mist are two of my favorites so far. Card bases are Aqua Mist. And here's a card that I added to my Papertrey Gallery. I tucked some duckies from Bitty Baby Blessings into the upside down umbrella. The ducks were colored with Copic markers. Image was layered with Rectangle and Scalloped Rectangle Dies. 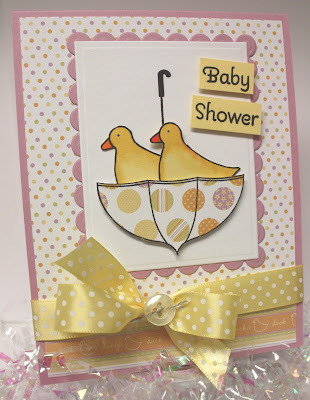 Patterned paper is from the Bitty Baby Blessings collection. Ribbon is Lemon Tart Swiss Dot with a white Vintage Button tied on. Did you add Scattered Showers to your list this month? I know it's a set I'll use again and again for baby showers, get well cards, cheer up cards and more. Hope you enjoyed this month's release! We had a very fun Easter weekend. I made the girls each a tag like this one below when my friend Carmen was here last week. I used the cute Easter set from My Cute Stamps along with some scraps of Cosmo Cricket paper and one of my home made button embellishments. Ribbon is Aqua Mist from Papertrey and the images were colored with Copic markers. Did you see the announcement on Nichole's blog that Papertrey is now going to carry Copics? Very good news! Here's the Easter baskets filled with goodies. Jordan got this beautiful book about fairies (I'll talk about this another day, I just have to share) and a Webkinz skunk. Josey got an Ipod card, new Ipod headphones and a teeny bop magazine...plus the usual Whoppers Eggs and Reese's Eggs. The girls have used these same green baskets I bought at Target years and years ago. I guess they're a tradition now because every Easter they dig them out, no other basket will do. My folks came over after church for Easter dinner..gotta love spiral cut ham, cheesy potatoes and mom's chocolate layer dessert! After dinner, Jordan showed us her new fairy book. It was based in the year that Grandpa was born..1933. The book gives some very good information on how to attract flower fairies. We barely got up Easter decorations this year. Jordan and I pulled these few things out on Saturday. Her colorful, frosted sugar cookies made an adorable centerpiece...that didn't last long once everyone figured out they were actual cookies. Interactive, edible centerpieces...a whole new concept. And of course we dyed eggs. This year our egg dye kit was glitter themed. You colored the eggs, dipped them in this liquid glue then put them in a bag with glitter and shook them. Very pretty. Next year Josey wants to pick the egg dye kit and she says it's going to be the camo one we told her about. She spent most of the mornings and evenings this weekend turkey hunting with Eric so her attire all weekend was camo colors. No turkey though. Jordan also went to see the new Hanna Montana movie with some friends. She gave it two thumbs up! Oh, we also flew some kites that the girls got from Eric's folks. It was the perfect weather for kite flying. Soooooo fun and brings back memories from my childhood. What did you do this Easter weekend? I hope you got to spend time with your families and friends. 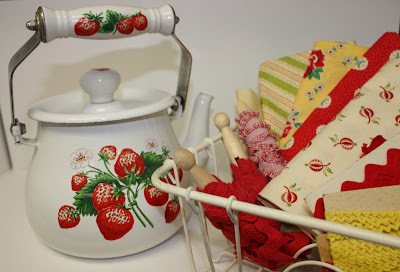 A couple summers ago my good friend HB (Carol) sent me this adorable vintage strawberry teapot. Jordan and I had been having little tea parties out on the porch, using a bunch of other strawberry themed goodies and HB thought this would make the perfect addition. I adore this tea pot and I think of HB every time I see it. 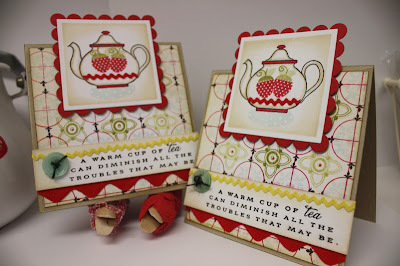 Well, as you know by now Papertrey is introducing a cute new set this month called Tea for Two, designed by Nichole. I immediately wanted to create something for a strawberry themed tea party. So I got out my tea pot, some vintage rick rack, some fabrics I purchased to make a table runner or something cute...and I found these three pages below from my Inspiration File. Zoom in to see the photos, I particularly love the red and white vintage fabrics in that cute table scape. I went to work right away, starting with some home made patterned paper. I used Guidelines and Guidelines 2 to make some vintage looking patterns, using inks in Pure Poppy, True Black, Aqua Mist, Ripe Avocado, and Spring Moss. These stamp sets remind me of Frank Lloyd Wright patterns (Arts and Crafts style architect). Zoom in to get a good look at the colors. 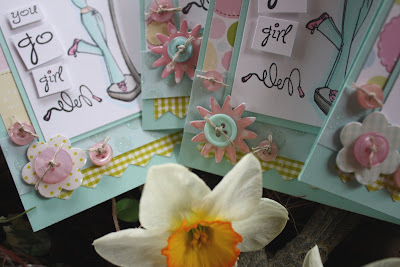 Here's my finished cards...perfect little invitations for a couple of girl friends. 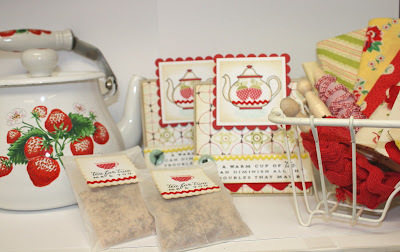 I used my original Tent Topper card layouts for these, putting the teapots front and center. Here's a close up of the tea pots. I first outlined the inside edges of the teapot image with a tan Copic marker (E31), then blended it with a Colorless Blender(0). The red I used for the details is a Copic red (R29). The teapots are accented with the small strawberries from Green Thumb. Tiny vintage rick rack from my stash is along the bottom of the teapots. I cut and embossed the teapot images with square Spellbinder's Nestabilities and matted the images with a Pure Poppy square Spellbinder's Nestie. 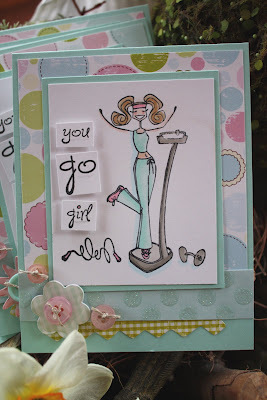 For the bottom of the cards, I used a fun sentiment from Tea for Two, stamped onto a strip of cardstock. I embellished the strip with a Vintage Button (guess the new color), tied with black twine. Vintage yellow and red rick rack from my stash finishes off the sentiment piece. ...and then inserted the bagged tea into Small Glassine Sacks. I punched a scalloped square, then stamped on the *tea for two* sentiment from Tea for Two, and the cute little tea cup from Everyday Expressions(PTI's anniversary set). I finished off the little squares with some tiny red rick rack and then messy stitched the tag right onto the glassine sack. And here's all my goodies together. Now who could I invite over for a little tea party?? Be sure to check Nichole's BLOG to see more of Tea for Two. I know many of you are already excited...the entire set is so darling and as usual Nichole has added in the best sentiments. I can't wait to see more creations with this set. I know they will be tea-riffic.